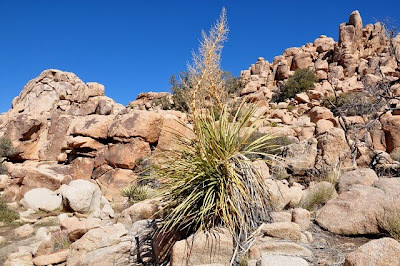 Near the closing of February I spent a weekend in Joshua Tree National Park. 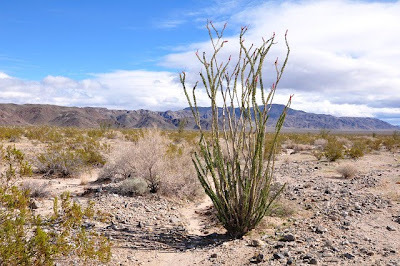 It was my third visit to the park and this time I targeted in on teddy-bear cholla (and of course cacti in general), Yucca brevifolia (one could argue they are hard to miss in the park;-), and another of my favorites that is covered in this post: the ocotillo (Fouquieria splendens) with its sprawling canes soaring for the sky. The ocotillo, characteristic of the Colorado Desert, prefers to root in gravelly slopes of alluvial fans. Flash floods flush sand, gravel, and rock out of the canyons and onto the valley floor creating these fans. Fouquieria splendens is sometimes confused for a cacti, but is not. 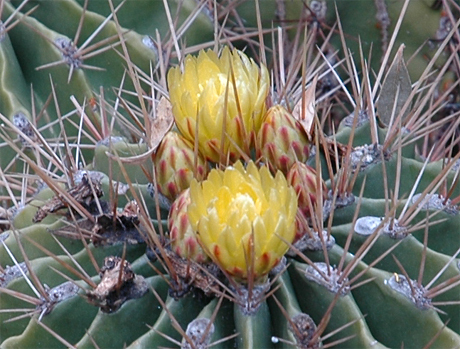 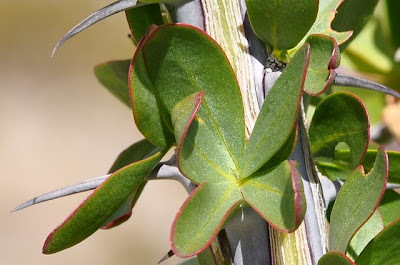 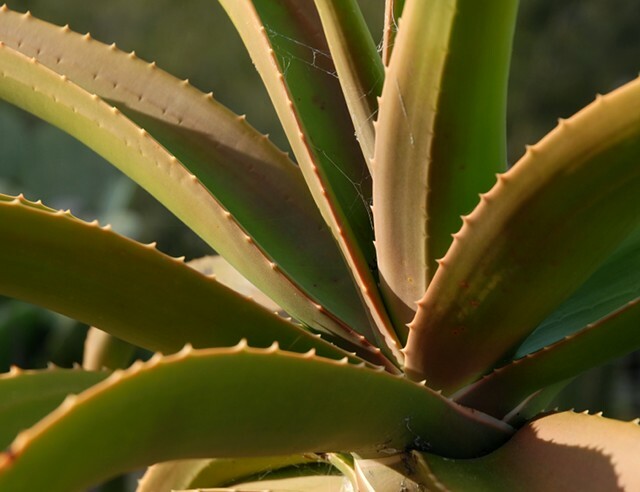 The thorny multi-stem shrub is in fact a woody deciduous plant. 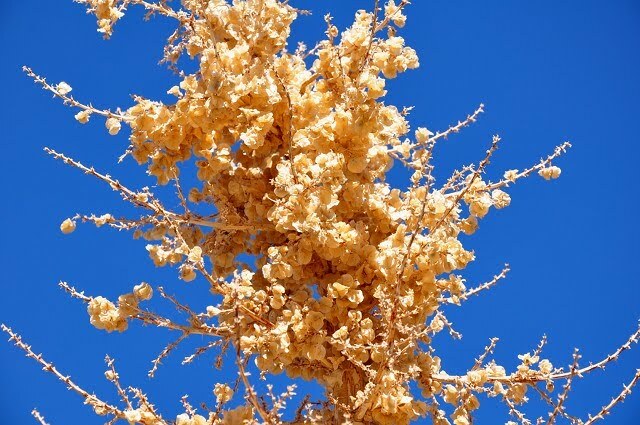 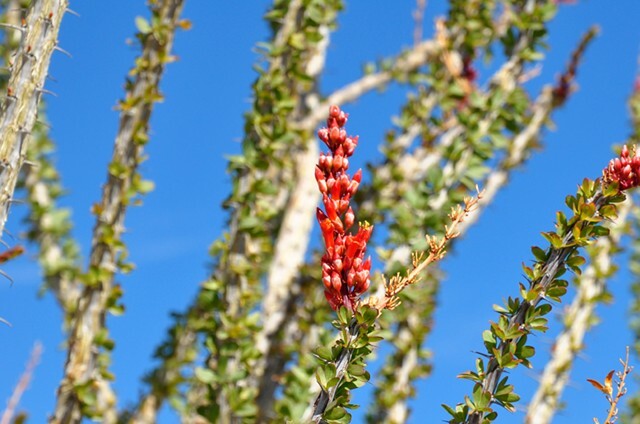 Unlike other deciduous shrubs, which normally grow leaves in the spring and drop them in the fall, the ocotillo may grow and drop leaves as often as five times during the year. Its leaves aren’t season dependent but rain dependent. 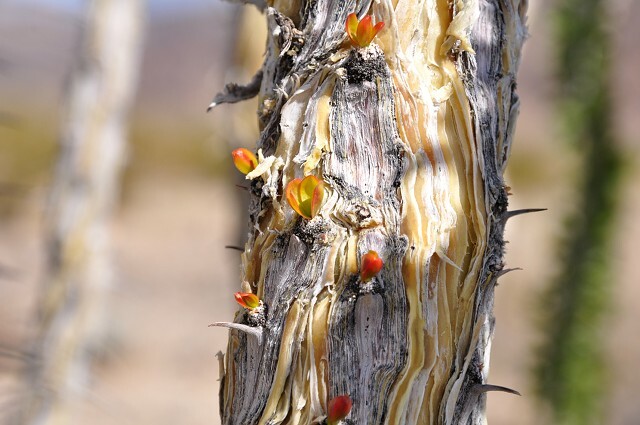 Following a sufficient rain, the ocotillo puts forth a cluster of leaves above each torn, adorning the otherwise dead-looking canes with a flourish of green. At the same time red blossoms may appear at the tip of the canes. The leaves go about the business of photosynthesis until the next drought; then they turn red or brown and drop. 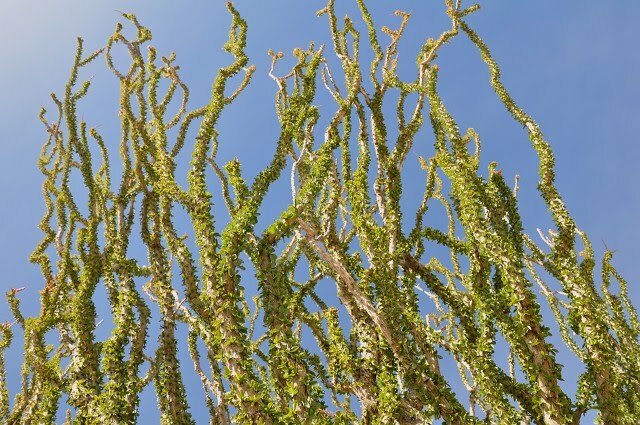 The above picture was taken standing on the ground looking up into the sprawling canes of an ocotillo. It gives an impression of the height of the plant as I stand 190 cm (6 feet 3 inches) tall and these plants tower above me. 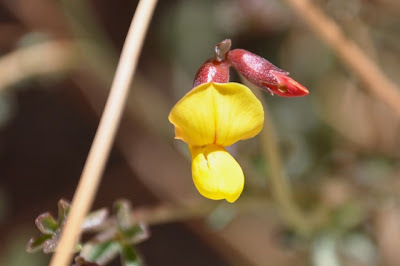 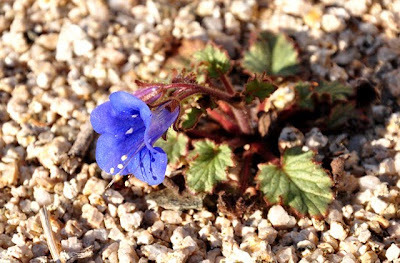 You can find more information on Fouquieria splendens in the book Sonoran Desert Wildflowers: A Field Guide to the Common Wildflowers of the Sonoran Desert. As mentioned in the previous post I recently visited southern California. During a day off I and a couple of colleagues decided to visit the San Diego Zoo - I have to confess that I also had a cunning plan to lure my not-so-cacti-interested colleagues into visiting the Desert Garden located in Balboa Park just next to the Zoo. 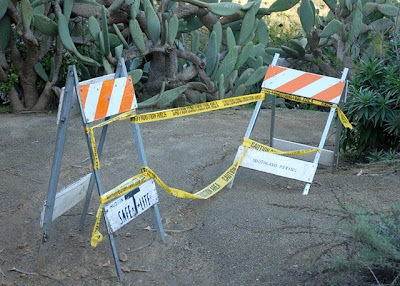 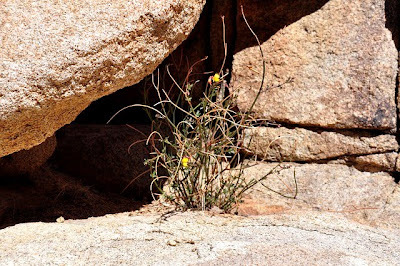 Yet another reason for coming back is that several of the pathways in the Desert Garden were closed during my visit due to heavy rains just a few days prior. 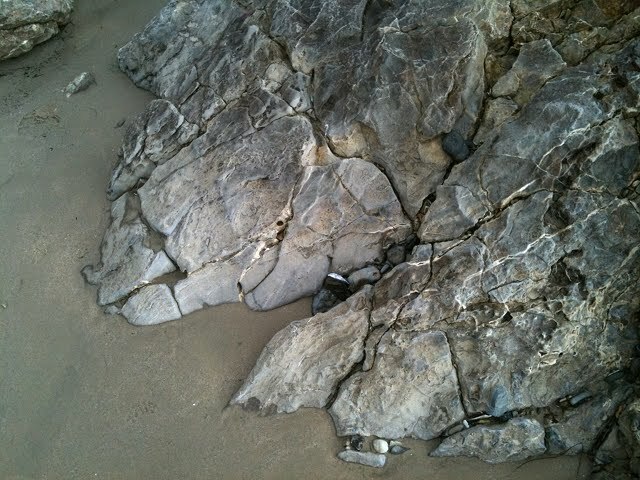 During a recent visit to Orange County I had a weekend to kill. 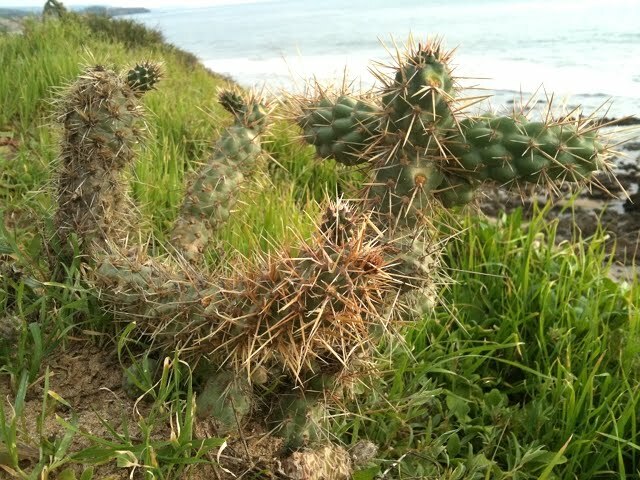 I neither had the energy nor the time to head for the open desert so instead I decided for a stroll at Laguna Beach. 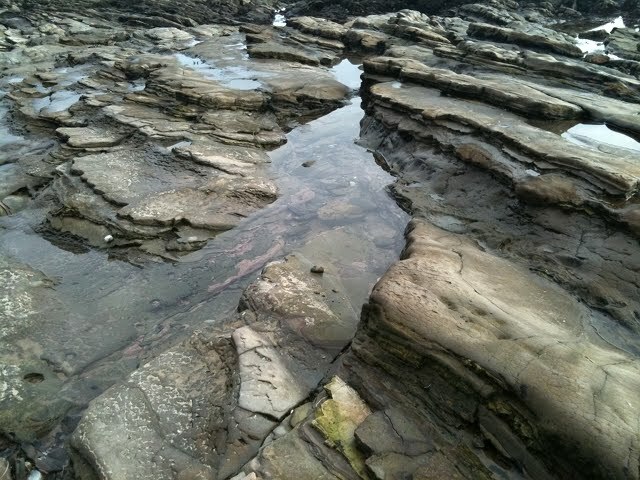 I never made it to Laguna Beach though. 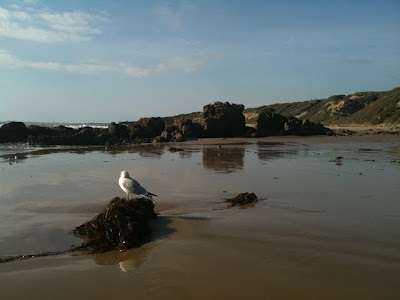 Cruising south on the Pacific Coast Highway I noticed a sign advertising Crystal Cove State Park and decided to check it out. I have to admit I was a bit surprised to see cactus growing that close to the sea - they even grow on the dramatic slopes of the coastal bluffs overlooking the Pacific Ocean. 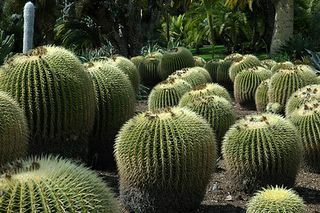 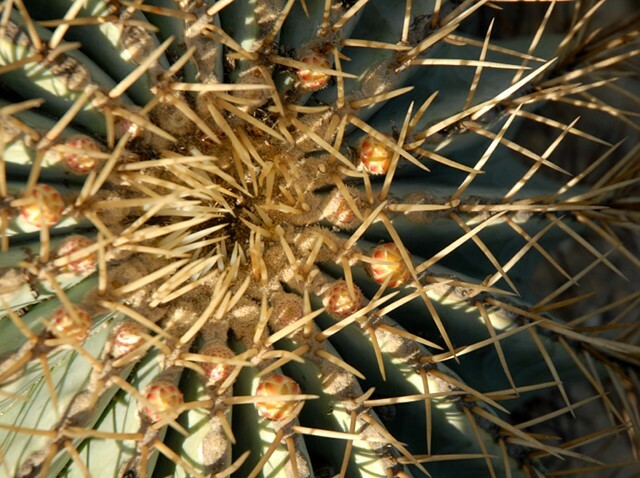 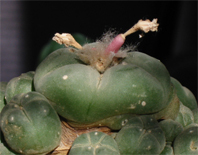 It just goes to show how diverse environments cacti are capable of coping with. 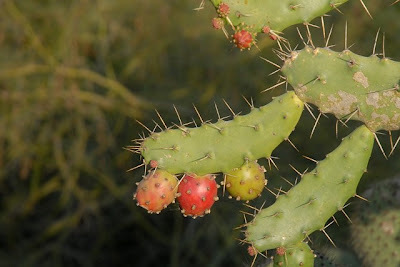 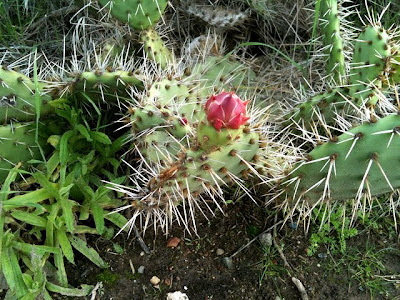 I’m not well versed in opuntioids but according to this Flora of Crystal Cove State Park the Cactaceae growing in the park are Opuntia littoralis (coastal prickly-pear) and Cylindropuntia prolifera (coastal cholla). It was quite magical walking the beach where the only sounds were the rumble of the breaking waves and the squeaking of seagulls, knowing that only a few hundred meters inland you would be engulfed in the ubiquitous noise of cars hissing by. I love the rock formations along California’s beaches, savor the fascinating sea cliffs that have been sculpted by winds and the relentless battering by waves through the ages. Unfortunately I didn’t bring my Nikon SLR for this trip and my phone is a less than ideal camera, but the pictures will have to suffice. 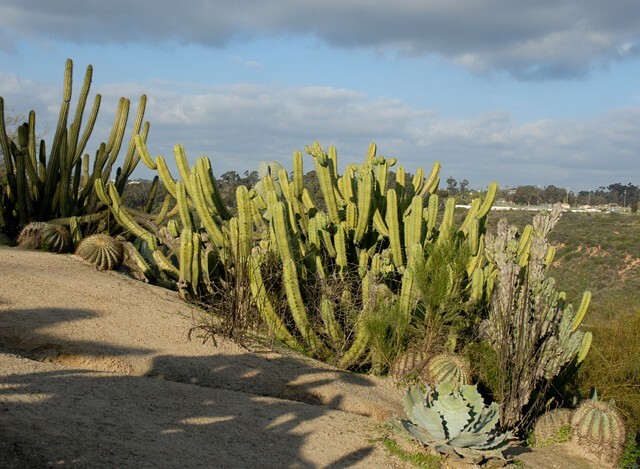 You can find more information on hiking Crystal Cove State Park in the book California's Coastal Parks: A Day Hiker's Guide. 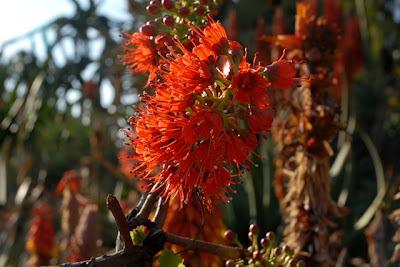 Saturday (March 05, 2005) I visited Huntington Botanical Gardens with high expectations. Initially I was a bit disappointed by the Desert Garden – the focus seems to be more on gardening than on botanical aspects, i.e. 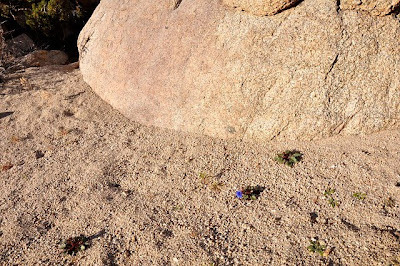 the plants were primarily grouped by appearance instead of by biotopes, many of the plants were unmarked etc. 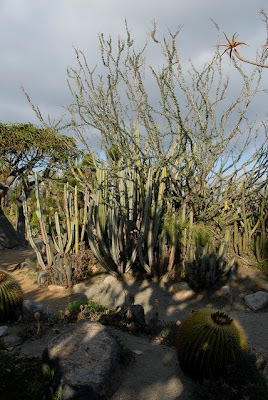 I should have been warned by the welcoming sign saying: The garden before you is hardly a desert ;-) Also a lot of the paths were closed with “do not enter” and “no admittance” signs! 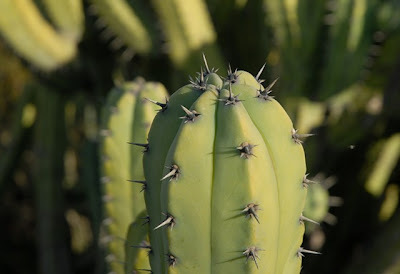 That being said, I ended up spending more than 3 hours studying the various species of cacti. Unfortunately very few of the cacti were blooming – I would like to return in a month or two when the flowering is in full swing. I took a lot of pictures. 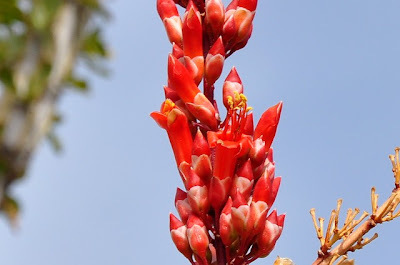 As time permits I’ll process and upload them to a photo gallery. 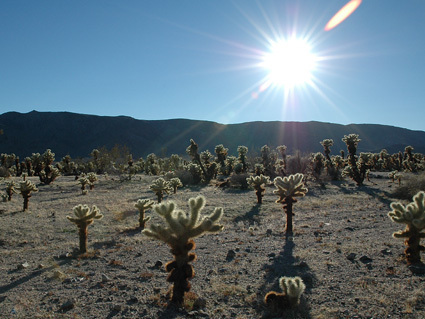 A field of Cylindropuntia bigelovii photographed during a recent visit to Joshua Tree National Park.